Working out in very cold temperatures or extremely hot temperatures pose safety risks to the athlete. While workout temperature preference may vary somewhat from person to person, most exercisers perform and feel their best when they work out at a moderate air temperature of around 70 degrees Fahrenheit. When training for a race or sport in extremely cold or hot conditions, however, the athlete should work out in similar climatic conditions to gradually acclimate the body. Working out in the heat can be dangerous, as your body temperature also rises during exercise. Hot weather exercise puts extra pressure on your heart and lungs, especially if the air is also humid. Your body's natural cooling mechanisms normally adjust to your body's higher temperature during exercise, as heat is dissipated through your skin and your perspiration level increases. During hot weather exercise, however, these cooling systems may fail, resulting in a heat-related illness such as heatstroke. 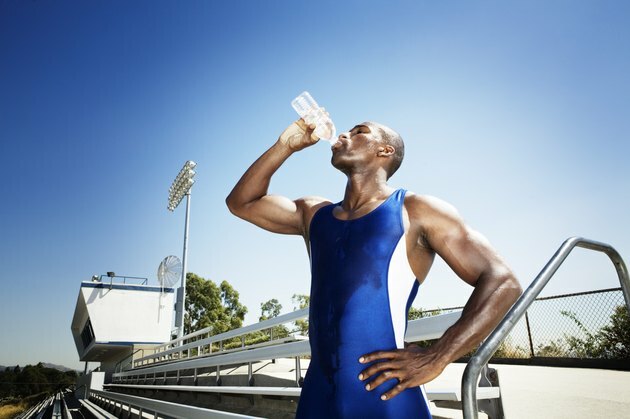 If you do exercise in the heat, drink plenty of fluids, wear lightweight clothing and sunscreen when outdoors. Stop exercising if you feel dizzy or nauseous. Exercising in the cold presents its own safety risks, as it leaves you vulnerable to frostbite and hypothermia. When working out in cold weather, dress in layers that you can remove once you start to sweat and put back on once your body temperature cools. You may also need to wear protective gear on your face, ears, hands and feet when exercising in very cold temperatures. Cold weather exercise is especially dangerous if the temperature drops below 0 degrees F, or if the wind chill is extreme. People with health conditions, such as asthma or heart problems, should talk to their doctor before working out in the cold. The ideal temperature for working out is between 68 and 72 degrees Fahrenheit. If you're exercising indoors, aim to keep the air temperature within this range. Personal preference varies to some degree, as some people sweat more than others during exercise, but 70 degrees F is the optimal temperature for most people, according to Gerald Endress, exercise physiologist and fitness director at the Duke University Diet and Fitness Center. In fitness centers or gyms where many people work out at the same time, using a personal fan during exercise can help heavy sweaters feel comfortably cool in a 70 degree F environment, says Endress. It's a common misconception that wearing sweats or a sauna suit during exercise will enhance the effects of your workout. While wearing heavy/non-breathable clothing during exercise will raise your body temperature and cause you to sweat more, this will only result in water loss, not fat loss. It will also leave you more vulnerable to dehydration and other heat-related illnesses. Therefore, it's best to work out in lightweight, breathable clothes that don't trap heat and sweat. Another thing to consider is that while "room temperature" is the best air temperature for working out, your body temperature, which varies throughout the day according to circadian rhythms, also affects the quality of your workout. According to the American Council on Exercise, exercising when your body temperature peaks -- in the late afternoon hours, for most people -- produces optimal workouts. NBC News.com: Is a Good Sweat Necessary for a Good Workout?